Simeon Osen spoke of the unique warmth he felt the community offered where Judaism was meaningful, fun and relevant. 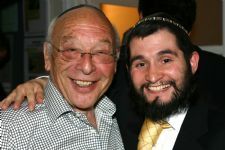 Rabbi Brandman spoke of the special friendships and supporter base they had built up, without which their holy work was not possible and sustainable. All funds are raised locally and the community supported a wide range of activities that touched many lives. Presentations were made to Neil and Alison Cohen, in recognition of the countless events and kiddushim they had helped cater for the Shul, to Paul Benham-Whyte for his services to the security of the Shul and for always being happy to lend a helping hand and to Paul and Martine Groman-Marks for their constant support.